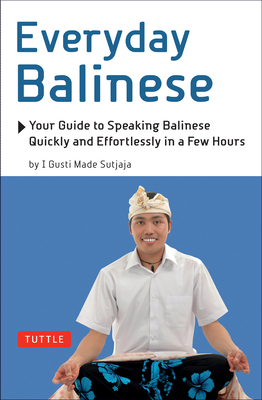 Everyday Balinese is targeted to anyone who wishes to learn to speak colloquial Balinese. There are 23 lessons in the book, each with a dialogue that centers around the Balinese daily life. These realistic beginner Balinese dialogues are a great way to learn Balinese as it is really spoken. The dialogue is presented twice: The first version representing the lumrah or common Balinese; the second the alus or refined Balinese. Both versions are exactly the same grammatically; the difference lies in the word choice. Lumrah or common words are used by participants of equal social status in a conversation, and it reflects intimacy and informality among the users. Alus or refined words are associated with distancing and formality among users in a conversation. Each lesson contains a section on the grammar an word function, as well as a list of words in both the lumrah and alus forms, followed by their Indonesian and English equivalents. Each lesson ends with a section on sentence construction--how to use the structures taught to make simple sentences. The book has a pronunciation guide at the front, and a section or greeting, ordinal numbers and a handy dictionary at the end. The dictionary is arranged alphabetically by Balinese, followed by their Indonesian and English equivalents. I Gusti Made Sutjaja has a Ph.D. in Linguistics from the University of Sydney and is Professor of Linguistics at the Faculty of Letters of Udayana University in Denpasar, Bali.